Tummy full, story read, Yawn, stretch, time for bed. . . . Now one more kiss and one more hug, I drift to sleep, safe and snug. A classic bedtime ritual experienced through a baby's eyes, this book conveys safe sleep practices in a gentle, rhythmic way. A perfect gift for new families, it was created for Charlie's Kids Foundation, whose mission is educating families about SIDS prevention. 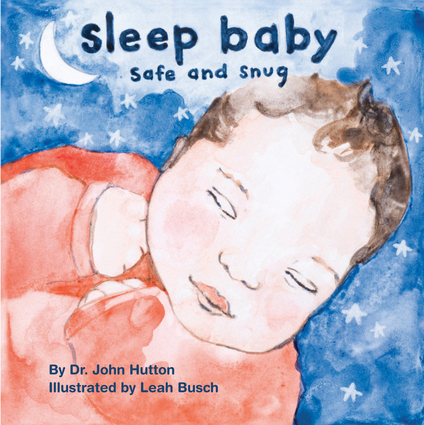 Dr. John Hutton is a pediatrician, author, and owner of the award-winning blue manatee children’s bookstore and decafé in Cincinnati, Ohio, and affiliate site blue manatee boxes. He is the founder of the blog Baby Unplugged, whose mission is to help keep children screen-free until age three and promote healthy, developmentally stimulating alternatives. Leah Busch is an artist and cocreator of the award-winning Toast to Baby series. She is the creative director, instructor, gallery director at Brazee Street Studios. They both live in Cincinnati, Ohio.